Warren, Pratt, and Howe trusses look somewhat similar, at least from a distance. However, the Warren truss is made up of isosceles triangles, the Pratt truss has diagonal members slanting down toward the middle of the span (to carry tension), and the Howe truss has diagonal members slanting down towards the ends (to carry compression). The Twin Cities Memorial Bridge is composed of pin-connected Pratt truss spans on concrete dog-bone piers over the Feather River and with a concrete trestle east of the river. The bridge was built in 1906 by the Northern Electric Railroad (NERR) Company to carry people (and freight?) between Sacramento and Chico. The production of cheap hydroelectric power allowed electric interurban rail lines to briefly flourish before the advent of the automobile. 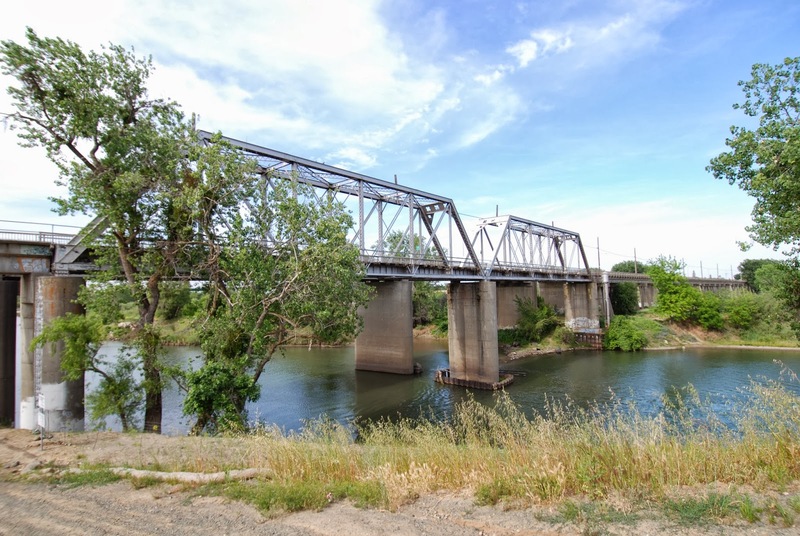 This railroad bridge carried people between Yuba City and Marysville, spurring the development of both cities. The NERR alignment veers west of the BNSF RR line (north of yesterday's bridge) and across the Feather River. The Twin Cities Memorial Bridge was selected for inclusion in the National Register of Historic Places. Besides its historical importance to the region are its distinguishing features including cloverleafs and the letters 'NE' (for Northern Electric) stamped onto the portal frames. Yuba County, California Bridges: Twin City Memorial Bridge across the Feather River by Mark Yashinsky is licensed under a Creative Commons Attribution-NonCommercial-NoDerivs 3.0 Unported License.